It was a real surprise to read this quote, or even to read thoughtful coverage of urban planning issues at all in the populist paper USA Today this week. High gas prices = densification planing in Phoenix. Everyone moves downtown. Suburbs become cities too. In a generation, our children long to move to the country the way that we longed to leave the suburbs for the cities. A 79 year old retiree and his wife conspired to cheat the Illinois government out of its gasoline tax – to the tune of $244. While one must respect the zealous nature of the Illinois Department of Revenue, whose agents visited the couple personally to issue a $2,500 bond for David Wetzel of Decatur, the case illustrates the obvious misfirings of local, state and government officials and entities as they struggle with the issues surrounding alternative fuels, like the vegetable oil that the Wetzels use to power their car. Gasoline taxes fund transportation projects, and energy transport alternatives (vegetable oil, electricity, the bus?) are taking away from the necessary revenue to fund that new super-highway, coming through a neighborhood near you. Though elected officials are be talking the talk about reducing our dependence on oil, it will obviously take some time before a green attitude is properly legislated and enforced. 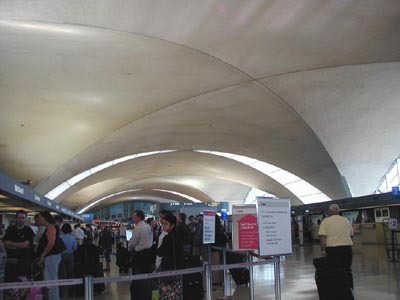 The St. Louis airport by Minoru Yamasaki echoes Saarinen’s soaring TWA terminal in New York City. While Saarinen’s terminal is arguably the finest architectural monument to air travel ever made, The St. Louis airport terminal is a mere concrete hiccup on the barren midwest landscape. At TWA, elegant forms reflect the glamour and excitement of a journey that people used to dress up for. In St. Louis the hulking, truncated forms reflect the mundane experience of passing-through, or reluctantly arriving at, a regional airport. “Headed to Nari-dah?” The airline attendants voice, a flat, high nasal midwestern accent, jolts me from my architectural reverie. I don’t understand what he is saying. This will be a common theme during my travels, but largely in Japan. 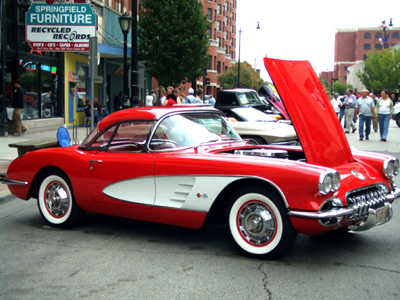 It was serendipity that I landed in Springfield during the famed Route 66 festival. Classic cars (exclusively american made) where on display throughout downtown, which strangely included a few mustangs from the 80’s. This raises oft-debated questions in preservation, at what point is a design object or building considered to have historic importance? How the accelerated production of objects and abbreviated duration of trends affect the act of preservation? 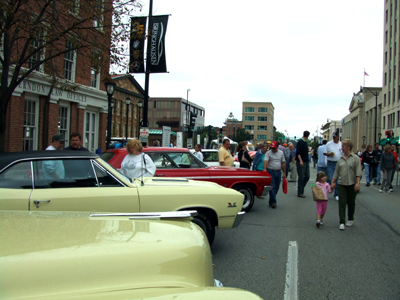 I could tell that the classic car afficiandos attending the festival were intensely contemplating these vital issues, deep in thought as they ambled through the closed off streets enjoying Springfield’s finest delicacy, the “cozy dog” (code name for corn dog). Or maybe their troubled looks had to do with the rain. 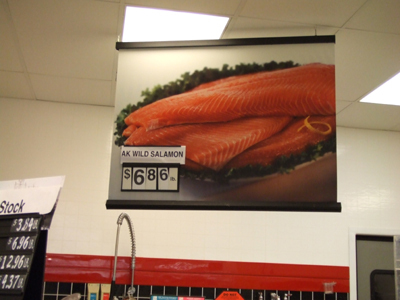 Wild salamon[sic] is $6.86/lb at the Super Wal-Mart in Springfield Illinois. I am consistently fascinated by economic discrepancies between my old hometown and my current hometown, New York City, where wild salmon sets you back as much as $20/lb. It costs extra if you spell it right. 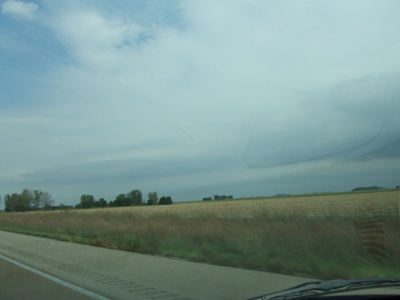 The terrain of the midwest is decidedly flat, crushed by a a glacial moraine some 100,000 years prior. This endless prairie is now carved up into pragmatic, tetris-shaped fields of corn, soybeans and wheat, their outlines visible from the air when you fly over the landscape on a clear day, as I did on Thursday.